Set a large pot of salted water to boil. Place flour in a shallow dish, and season with salt and pepper. Dredge cutlets, shaking off excess. In a large skillet, heat 1 tablespoon oil over medium-high. Cook chicken in batches, adding remaining oil as needed, until light golden, 1 to 3 minutes per side; transfer to a dish. Add broth to skillet, and bring to a boil; cook until reduced by half. 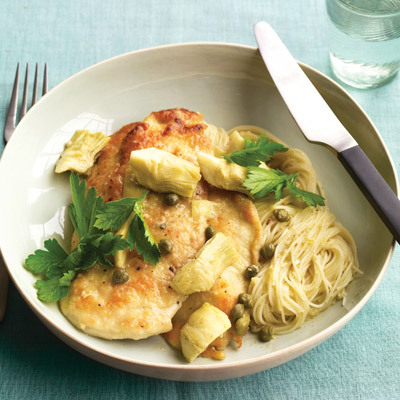 Add artichokes, capers, and the chicken with any juices. Gently swirl to combine, and bring just to a boil. Remove skillet from heat. Swirl in butter, and cover to keep warm. Add pasta to boiling water. Cook until al dente; drain. Serve chicken and sauce over pasta, topped with parsley.